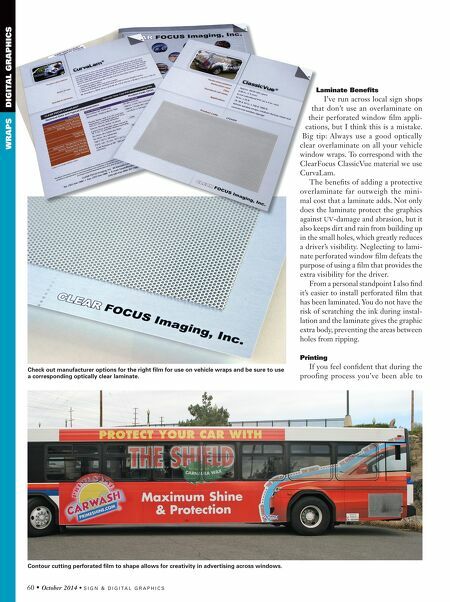 S I G N & D I G I T A L G R A P H I C S • October 2014 • 61 properly scale the graphics then you can go ahead and print your window- perf graphics prior to the vehicle being brought in for installation. Be sure to overprint the graphics that will cover the windows. Allow yourself a couple inches minimum all the way around. The extra material will help with alignment to the surrounding artwork and will give you something to grip during installation. Overprinting the graphics is always helpful in all aspects of wrapping. 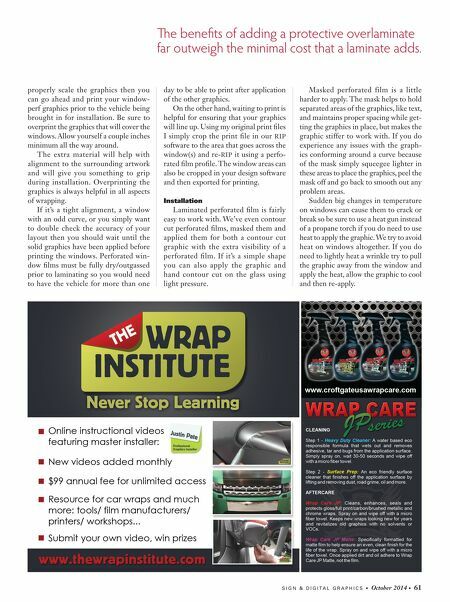 If it's a tight alignment, a window with an odd curve, or you simply want to double check the accuracy of your layout then you should wait until the solid graphics have been applied before printing the windows. Perforated win- dow films must be fully dry/outgassed prior to laminating so you would need to have the vehicle for more than one day to be able to print after application of the other graphics. On the other hand, waiting to print is helpful for ensuring that your graphics will line up. Using my original print files I simply crop the print file in our RIP software to the area that goes across the window(s) and re-RIP it using a perfo- rated film profile. The window areas can also be cropped in your design software and then exported for printing. Installation Laminated perforated film is fairly easy to work with. We've even contour cut perforated films, masked them and applied them for both a contour cut graphic with the extra visibility of a perforated film. If it's a simple shape you can also apply the graphic and hand contour cut on the glass using light pressure. Masked perforated film is a little harder to apply. The mask helps to hold separated areas of the graphics, like text, and maintains proper spacing while get- ting the graphics in place, but makes the graphic stiffer to work with. If you do experience any issues with the graph- ics conforming around a curve because of the mask simply squeegee lighter in these areas to place the graphics, peel the mask off and go back to smooth out any problem areas. Sudden big changes in temperature on windows can cause them to crack or break so be sure to use a heat gun instead of a propane torch if you do need to use heat to apply the graphic. We try to avoid heat on windows altogether. If you do need to lightly heat a wrinkle try to pull the graphic away from the window and apply the heat, allow the graphic to cool and then re-apply. e benefits of adding a protective overlaminate far outweigh the minimal cost that a laminate adds.